One of Detroit's top priorities in 2018-19 is to reverse the downward direction of its power play. Over the past two seasons, Detroit has a power-play percentage of 16.3 (last in NHL), down from a combined 21.4 percent in 2014-15 and 2015-16 (fourth). 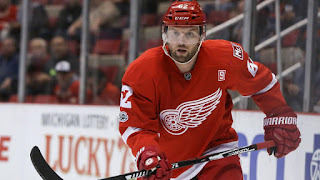 Of the 135 NHL players to score at least 25 points with the man-advantage over the past two seasons, forward Henrik Zetterberg, whose return this season is in question because of lingering back issues, is the only one to do so for the Red Wings, and he was tied with 11 other players for 87th with 31 power-play points (three goals, 28 assists) in 164 games. To address this, the Red Wings signed free agent forward Thomas Vanek on July 1. He had 28 power-play points (nine goals, 19 assists) over the past two seasons with the Vancouver Canucks and Columbus Blue Jackets. Detroit also re-signed defenseman Mike Green on June 30. He had 23 power-play points (four goals, 19 assists) in that span, tied for 39th among NHL defensemen with Will Butcher of the New Jersey Devils and TJ Brodie of the Calgary Flames. Last season, Detroit's defensemen combined for 128 points (30 goals, 98 assists), which ranked 28th in the NHL. That's up from the 113 combined points (31 goals, 82 assists) from its defensemen in 2016-17, which ranked 28th out of 30 teams. The Red Wings need improved shot-based metrics from their top four defensemen. Over the past two seasons combined, Jonathan Ericsson ranked 323rd among NHL defensemen with a shot attempts differential at 5-on-5 of minus-201, Green was 324th at minus-213, Danny DeKeyser was 327th at minus-219, and Trevor Daley was 344th at minus-310. The Red Wings had a 14-1 record in the shootout over the past two seasons. That's a notable improvement from their 13-29 record from 2012-13 through 2015-16. In the past two seasons, their shootout scoring percentage was 36.9 (seventh in NHL), and their save percentage was .836 (first). In the four previous seasons, their shootout scoring percentage was 25.2 (26th), and their save percentage was .625 (28th). The Red Wings' shootout lineup is led by Frans Nielsen, who has an NHL-high 48 career shootout goals in 96 attempts (50 percent). Vanek is tied for 19th with 28 goals in 70 attempts (40 percent).